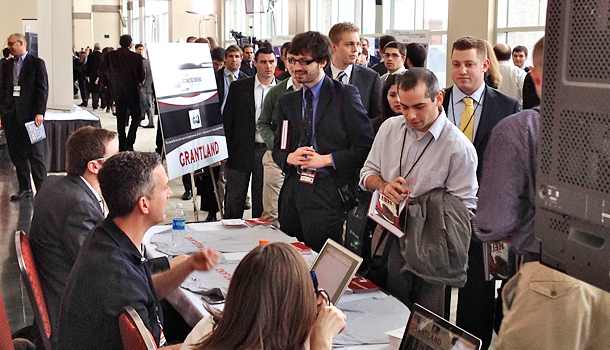 The annual sports stat geek conference held at MIT’s Sloan business school is part Star Trek convention, part academic conference, part job fair, part media circus (thanks, ESPN! )–and the future of the $400 billion sports business. Kirk Goldsberry and his geographic-based shooting analysis scored big at Geekapalooza this year. The crowd, still buzzing from the heady action, heads for the exits on Saturday night. The unlikely star from Harvard looks spent, hair disheveled, shoulders slumped. Everyone in the sports world suddenly wants a piece of him: NBA teams, the media, fans who stop to shower him with congrats. Kirk Goldsberry doesn’t actually play basketball–he’s a visiting scholar with a PhD in geography–but at the recent MIT Sloan Sports Analytics Conference in Boston he’s nonetheless having a Jeremy Lin moment. Ordinarily, Goldsberry does health care research. He creates maps that reveal a community’s lack of access to fresh produce, and he publishes his findings in academic publications such as the Journal of Hunger and Environmental Nutrition. 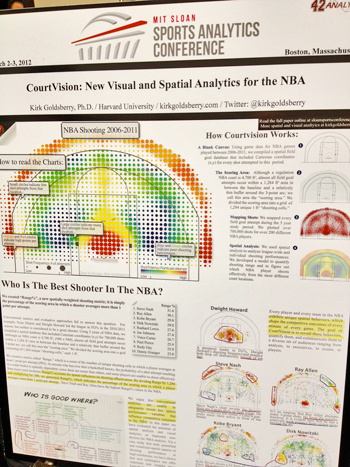 But it’s Goldsberry’s latest research paper–“CourtVision: New Visual and Spatial Analytics for the NBA”–that has thrust him into the sports geek limelight. “I woke up yesterday never having been on national TV or in The New York Times and Sports Illustrated or interviewed by the Wall Street Journal,” he says, incredulous that all those things have since happened. This is the Age of Data, when smart companies gather and interpret every possible scrap of information about every aspect of their business in hopes of gaining a competitive advantage. Sports, always awash in statistics, has become a fascinating crucible for how analytics can transform an industry. Teams, particularly those in pro baseball and basketball, are focused on using numbers to improve player evaluations and game strategies. They’re hiring PhD-level statisticians. They’re assembling teams of analysts, an alternative-universe version of their on-court team. And in the case of the defending NBA champion Dallas Mavericks, they’re even putting one of these modern-day mathletes on the bench to offer input during a game. Grantland founder Bill Simmons signing a new compilation for the countless Simmonsians on hand. The Sloan sports analytics conference, dubbed Geekapalooza by Dallas owner and regular attendee Mark Cuban and Dorkapalooza by ESPN columnist, podcaster, and ubiquitous panel moderator Bill Simmons, is ground zero for the sports world’s evolving relationship with analytics. Held the first weekend of March at the downtown Hynes Convention Center, the sold-out event drew more than 2,200 people, up from 1,500 last year. Officials from the major sports leagues are here, as are team owners and executives from 73 pro and college teams as well as representatives from a Who’s Who of corporate America, including the usual suspects (Nike, CAA, and Ticketmaster) and some not so usual ones such as Facebook, Goldman Sachs, and IBM. Nearly a third of the crowd consists of students, from 175 schools, including the country’s top business schools. The first conference, six years ago, was small enough to be mistaken for a class at MIT’s Sloan School of Management, with just 60 people. Now ESPN, the lead sponsor, brings in more than that many staffers, nearly 100 this year, to use its promotional muscle and savvy to turn an event where much of the action involves presenting academic papers into a high-profile, entertaining affair. It films an episode of its Numbers Never Lie show live at the conference, devotes the latest issue of ESPN the Magazine to analytics, and cranks out podcasts and short videos online. This isn’t the ESPYs by any stretch. When the talk here turns to models, they’re talking about the mathematical variety. But for those who aren’t athletes and love endlessly dissecting sports, the gathering is divine. You don’t need a math degree to grasp that the odds of a team sharing its know-how here are low. Even those execs appearing on the promising “Basketball Analytics” panel. “The key is talking without giving anything away,” Boston Celtics assistant general manager Mike Zarren admits on stage. It’s impossible to tell what Alamar thinks. “Academics have great tools,” he says, “but they don’t think like GMs or coaches.” It’s the sort of cryptic comment that suggests he’s either dismissing the easel in front of him or offering a red herring to throw other teams off. Okay, fine. So what exactly does Alamar consult on for the Thunder? “I can’t say,” he says with a smile. Even so, his analysis influences specific transactions, right? Another grin. “I’m not allowed to talk about it,” he says. So numbers that change what a pitcher throws in a game or maybe prevent an injury before it happens. That sort of thing? Tippett’s eyebrows arch, but his lips are sealed. The Sloan event began really as a conversation between friends. Jessica Gelman and Daryl Morey, both sports nuts and former consultants, both with Ivy League MBAs, would get together and talk about the future of the industry. Gelman, who had a stellar basketball career at Harvard and played professionally in Europe, worked for the Kraft Sports Group, which owns the Patriots. Morey, now general manager of the Houston Rockets, was senior vice president of operations and information for the Celtics. A computer science major and avid reader of sports stats pioneer Bill James, he was eager to introduce more advanced data analysis to the NBA. At Sloan, where Morey earned his MBA, the two taught a six-week course, bringing in sports executives to share their experiences. “He was doing the team side, and I was doing more the business side,” says Gelman, vice president of customer marketing and strategy at Kraft. In 2006, the Rockets disrupted Gelman and Morey’s plans to develop a semester-length course by hiring him as assistant general manager, a shocker around the league and a huge validation for his data-driven approach. A year later, at just 35, Morey was promoted to GM. Meanwhile, he and Gelman turned their class into an annual conference. In the wake of Michael Lewis’ bestseller Moneyball, the industry’s appetite for new data and fresh thinking was huge. The second year, the GMs of the four reigning championship teams shared the stage at Sloan (five champions are represented this year, including Manchester United). Then nerd darlings Michael Lewis and Malcolm Gladwell came. ESPN got involved. And Cuban became a regular, sitting in on the academic research presentations. The agenda keeps expanding. This year, MIT Sloan Sports includes sessions on the effectiveness of sponsorships and the importance of “fanalytics,” data on fan behavior, to drive ticket sales and better pricing. There are trade show booths down the hall from the research papers. The Vitamin Shoppe tries to convince teams, including the Milwaukee Brewers, that its protein shakes fuel athletes to put up good stats–legally, they emphasize (good to know if you’re the Brewers given the Ryan Braun controversy). Edge 10, a software company from England, charts health-related data on athletes. (The red icon indicates a bad day–“Maybe he had a niggle,” says Edge10’s Richard Dry, using a Harry Potter-sounding term for a slight injury.) TeamRankings promotes “Stat Geek Idol,” its March Madness competition for sports analysts judged by Cuban, Morey, Groupon chief data officer Mark Johnson, and other data heavyweights. The conference shows how pervasive data has become in sports and where the gaps still remain. “It’s hard to get reliable data on college football,” bemoans Eddie Pettis, a Google tech manager by day and co-author of the football blog Tempo Free Gridiron. “Baseball has a large advantage.” Which is part of the draw, though, to be a pioneer, the Bill James of another sport. True, but the feet-dragging doesn’t make sense to O’Shannessy, who routinely tapes matches to tag rallies and scour the results for strategic clues. Analytics, he says, “should be a strength of our game. Tennis is a game of patterns.” Patterns such as Federer’s serve, which according to O’Shannessy, are 50% are wide to the forehand side. 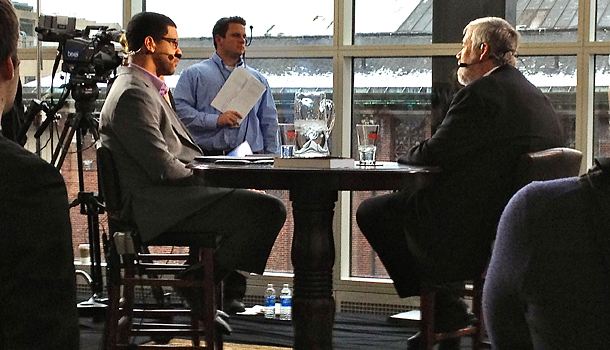 Stats icon Bill James (right) appearing on ESPN’s Number Never Lie with co-host Michael Smith. “This conference is the culmination of 30 years of my work,” Bill James tells a packed house on Friday afternoon. He’s on stage with Simmons for a little one-on-one chat, the old guard and the new, which the nerd faithful have been waiting for. 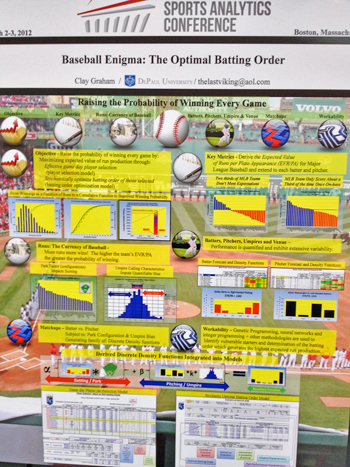 Today, it’s hard to grasp how modestly the modern era of sports analytics began. Before the launch of ESPN or sports fantasy leagues or even computers for that matter, James, a former English teacher, pored over baseball box scores and scribbled charts by hand at a pork and beans factory in Lawrence, Kansas. When he wasn’t checking the boiler, he was developing unconventional stats to assess the performance of players. Baseball wouldn’t give him the time of day. But James got through. “I always believed when in an argument it’s immensely powerful to have the facts on your side,” he says. He created sabermetrics, a stats-intensive study of baseball and published more than two dozen “Baseball Abstracts” books. In 2003, one of his former readers, Red Sox owner John Henry, hired him. James, who received World Series rings for Boston’s 2004 and 2007 championships, still works for the team as a consultant. Goldsberry making his national TV debut on ESPN. He turned to the data, every field goal attempt–more than 700,000–in every NBA game played between 2006 and 2011. What gets overlooked in evaluating shooting, he says, is where the shots are taken. So he divided the court into 1,284 possible “shooting cells,” adding a layer of geographic information, his specialty, to the conventional measure, the percentage of shots a player makes. Someone who shoots well from more areas of the court, Goldsberry reasons, has better range and is more effective than an accurate but predictable shooter rooted to fewer spots on the court. The league’s best shooter, then, isn’t high-scoring young gun Kevin Durant or LeBron James. It’s the Phoenix Suns’ ageless point guard (truth be told, he’s 38, but you’d never know it) Steve Nash. Saturday, as the event winds down, a high school student from the New York prep school Horace Mann stops Goldsberry and gushes, “I read your paper!” This being a stats conference and not a sporting event, an autograph won’t do. The kid wants the poster-board showing five years of shots taken by the Mavericks’ Dirk Nowitzki (the league’s fourth best shooter, according to Goldsberry). “I’ll buy it,” the student offers. 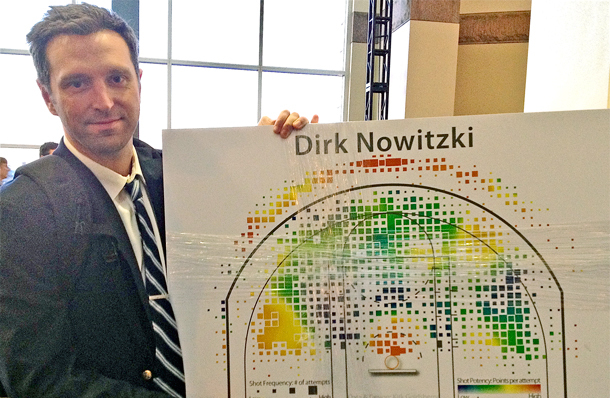 Holding the Nowitzki chart like an airport limousine driver, Goldsberry positions himself outside the hall. Soon enough, Cuban is heading his way. But he’s flanked so closely by another researcher pitching his idea that Cuban doesn’t seem to notice. Disappointed, Goldsberry gathers his things. By the escalator, he gets a second chance. Cuban is waylaid by another researcher. 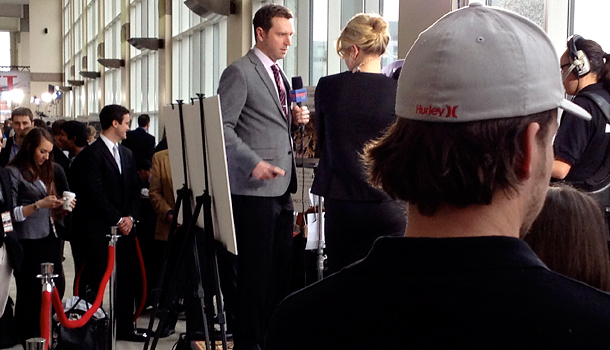 When he’s through, Goldsberry steps in for his Shark Tank moment. He holds up the chart. Cuban’s eyes light up. “I saw that!” he says. After a few minutes, Cuban leaves with the business card Goldsberry had printed up for the conference, featuring miniature color-coded shot charts on the back. It’s a small, clever touch. Who knows, it might just increase his odds.